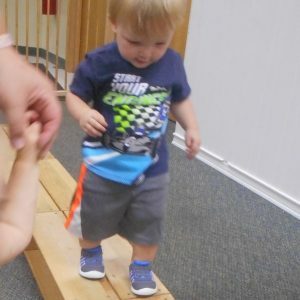 The infants at the Canandaigua Center love practicing their balancing skills! They will climb on the mats and stand on different materials to practice balancing. 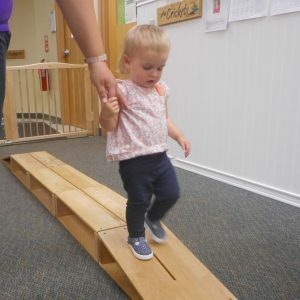 One of the infants’ favorite activities is creating a wide balance beam out of giant wooden blocks. 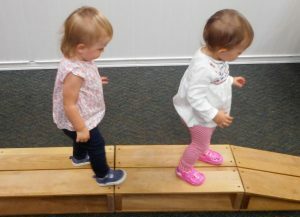 They will step up on the blocks and practice walking across them with the support of a teacher, if needed. By the time they have walked all the way across the blocks, they have a big smile on their face! Doing this activity helps to build the child’s self-esteem, supports hand/eye movements, and gives them the opportunity to practice balance/coordination skills.